Doggie Latchkey’s daily dog walking service is recommended for every dog, and it’s a must for clients working extra long hours. No one has to tell you how much a walk means to your pet! Most of us can’t even say the word and some of our pets have even caught on to us spelling it: W-A-L-K. The fresh air and exercise are vital elements to your pet’s well-being. Contact our office in Michigan to get started! Dogs are natural walkers and travelers with an instinctive need to explore new territory beyond their own backyard. According to Cesar Millan in his book Cesar’s Way [Crown Publishing Group, 2006], dogs have a migratory instinct within them that the daily walk helps to satisfy. Our daily dog walking services can be adjusted for the needs of each individual dog. A high-energy dog, such as a Border Collie, should be walked for a longer period of time than a toy breed dog, such as a Yorkshire Terrier. Walking the Border Collie for an hour will help burn excess energy, while a half-hour walk may suffice for the Yorkie. Doggie Latchkey can incorporate our professional dog training package into your daily dog walking. Especially for puppies, the daily dog walk can be a vital time to teach your dog important training habits, and our bonded dog walkers will tailor each visit to meet your dog’s individual needs. 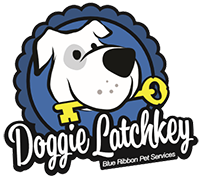 With a professional trainer on staff, Doggie Latchkey is able to provide the best all-in-one, comprehensive pet care package—designed just for you. Morning, afternoon or evening dog sits are specially designed for clients who work long hours, have an emergency situation or just have little time to spare. We have all experienced times when there is just not enough time in the day between work and family activities. The mid-day dog sit can be the solution to lighten your load and make sure your faithful pet is not left behind. Scheduling a daytime visit can also save you time and energy, since you won’t need to rush straight home to let the dog out. This is one of Doggie Latchkey’s most popular dog walking services. Many pet owners find this can be more cost-effective, while still providing your pet with the attention it deserves. During the pet sit, your pet will be provided with fresh water, food, love and affection, playtime and a healthy walk outside in the fresh air. Contact us to schedule dog walking!